Can you guess which ice cream made with crème-brûlée recalls the epic battle between the Russian and French armies in 1812? In Soviet times, it was believed that foreigners traveled here only for three reasons: to see the ballet, to visit the circus and to eat ice cream. I don’t know if there is any truth to that legend, but Soviet ice cream was really worth coming here for. Back then, the standards for ice cream production were very strict and extremely specific, controlled by GOST (Government Controlled National Standards). The star of this frozen creamy paradise was “plombir,” which is basically a simple milk-based ice cream that originated in France, but which became popular across the Soviet republics. Plombir was different because of its higher milk-fat content. Also, the Soviet version used sweet condensed milk, in addition to plain white sugar. Due to the shortage of milk-fat, however, the demand for plombir was not always met, especially outside of Moscow and Leningrad, as well as in the capitals of the Soviet republics. That’s why plombir was also the most desired. 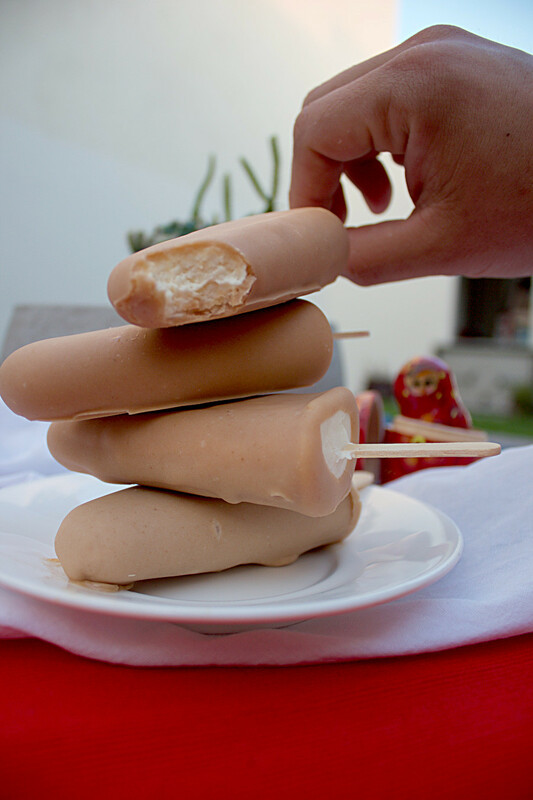 Naturally, plombir became a base ingredient for different types of ice cream, such as eskimo, which is plombir in a popsicle form with chocolate glaze; and stakanchik – plombir in a soft cone. Only at the end of the 1960s did the USSR acquire the equipment to make ice cream in the form of a cylinder. The first such ice cream had a whipped chocolate glaze and was named “lakomka" (gourmet). 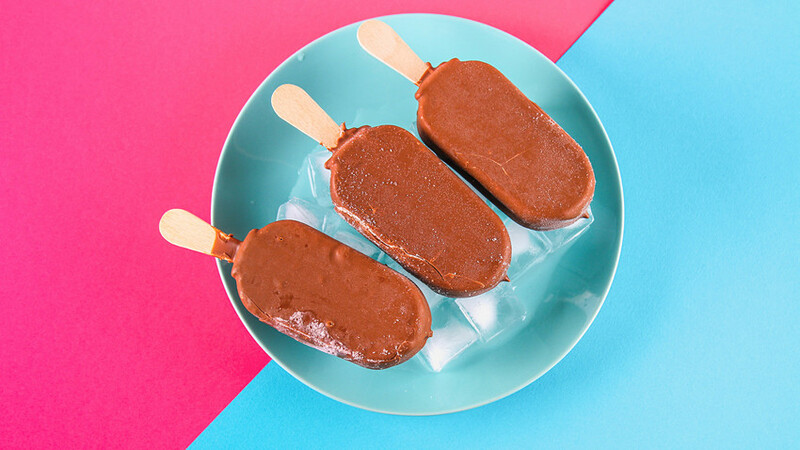 The chocolate glaze made by Soviet chefs is what made this ice cream exceptional, and it was an instant success. Unexpected poor weather in Latin America, and a subsequent decrease in imports of cocoa beans from the region, changed the plans of chefs. It was not possible to produce lakomka in large volumes, and in order to solve this dilemma chefs came up with a new glazed recipe called “The Nutcracker,” which was obviously made with nuts. All of a sudden, however, there was trouble ensuring a reliable supply of nuts from abroad, and chefs had to come up with a new type of icing to avoid a shutdown. That’s when the ice cream called “Borodino” appeared in 1977. This glazed crème-brûlée frosting was made with butter and crème-brûlée syrup. There was always enough supplies of syrup because it was made from domestically-produced sweet condensed milk and sugar. The cylinder was wrapped either in aluminum foil or paper that had images of cannons in memory of the Battle of Borodino between the Russian and French armies in 1812. Russia claims that it won the battle, but western historians say that Napoleon was victorious. Why was the ice cream called Borodino? My guess is because it had a crème-brûlée component - the traditional French desert. And with the reference to the Battle of Borodino it’s sort of a boast that victory went to Russia. As a child, I wasn’t allowed to buy the cylinder-shaped ice cream because it melted rather fast in my hands and got my clothes dirty. But oh my! How much I loved that icing. Even though Borodino is no longer sold, now that I’m grown up and can eat any ice cream I want; and I go for plombir with the crème-brûlée icing because it’s unforgettable. 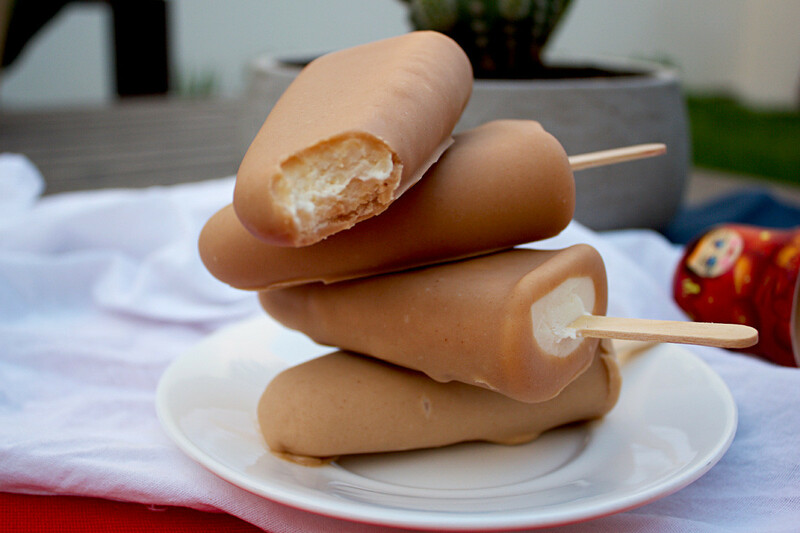 So, let’s make this Soviet-era dessert into a popsicle and give it a modern twist! Hydrate the gelatin with 50g of cold milk. Set aside. 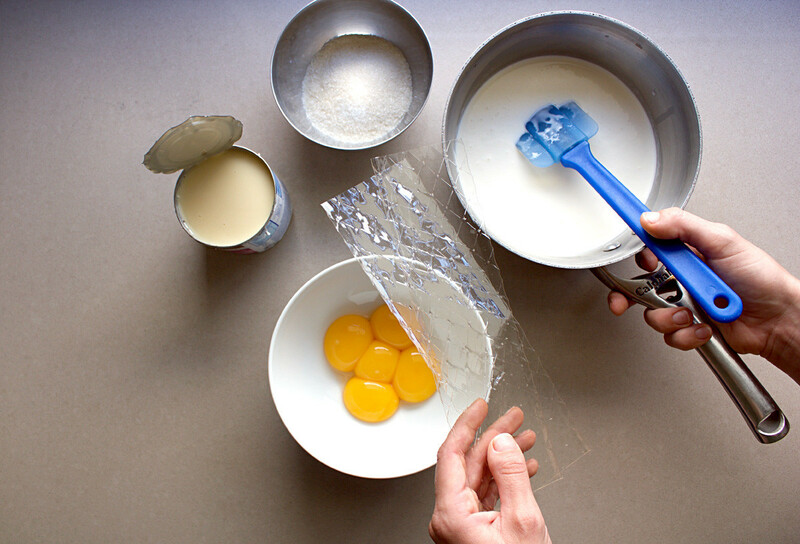 Mix the egg yolks with sugar and whip the mixture until it lightens in color. Put the rest of the milk (300g) in the pot and add 200g of cream. Start heating it and add milk powder. Bring the mixture to a boil, continuously whisking it. 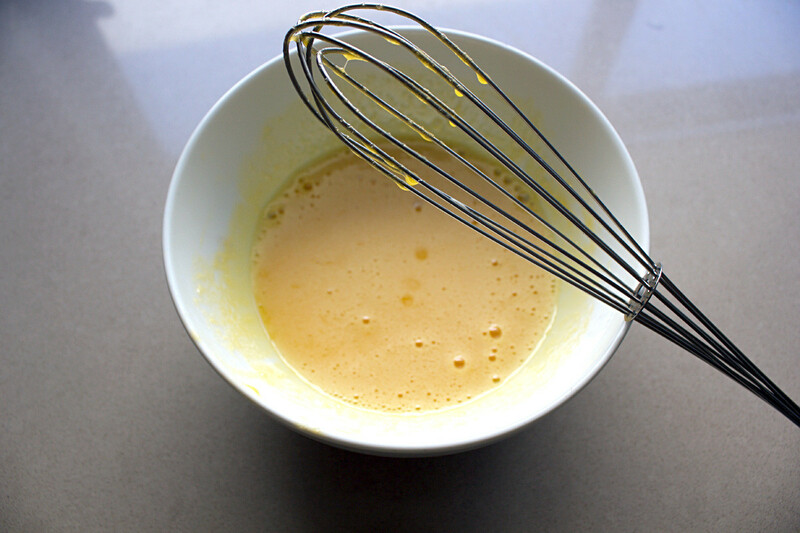 To temper the egg yolk mixture, pour a part of the milk/cream mixture that we just heated up into the egg yolks. 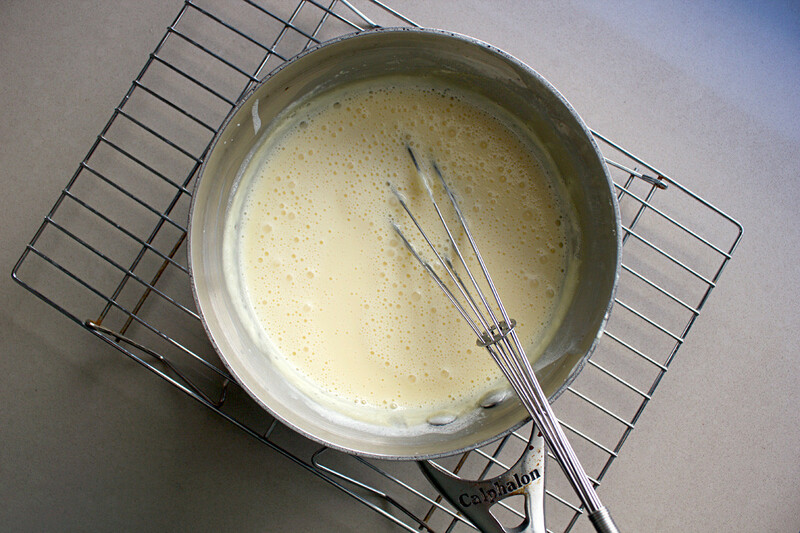 Mix until homogenous and pour into the pot with the rest of the milk/cream mixture. Continue cooking on low heat until the mixture temperature is 83 degrees Celsius, then cool in an ice bath. 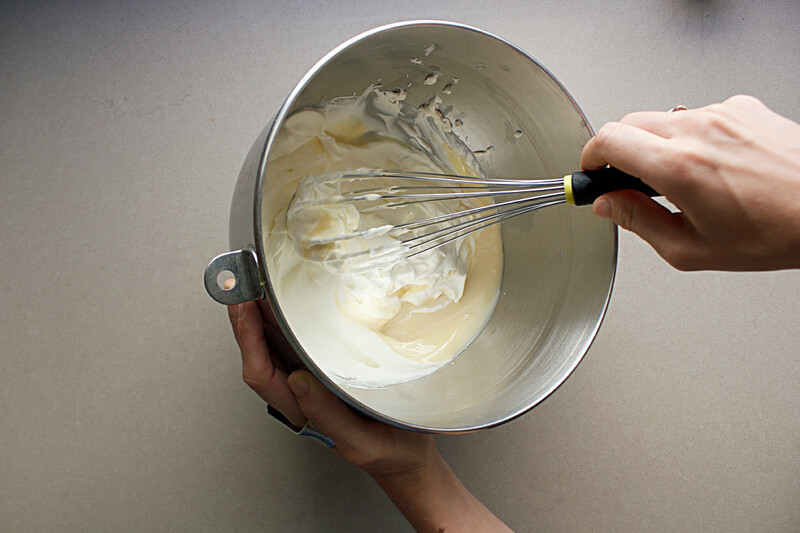 Whip the rest of the cream (300g) until it doubles in volume and becomes thick. Add in your sweet condensed milk. 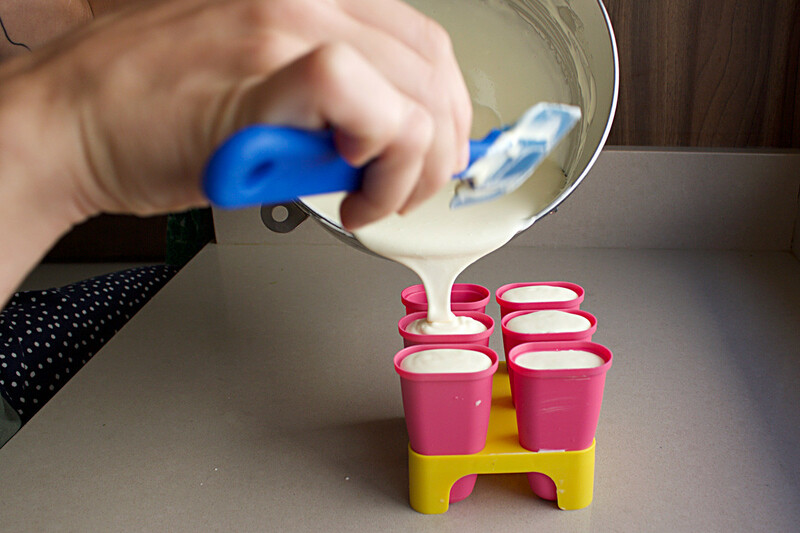 Once the cooked mixture has cooled, add in the whipped cream with condensed milk and put into the popsicle molds. Leave to freeze for at least 3 hours or overnight. Put sweet condensed milk, sugar and 15g of water in a small pot. Cook by constantly whisking until it caramelizes and turns brown but not burnt. 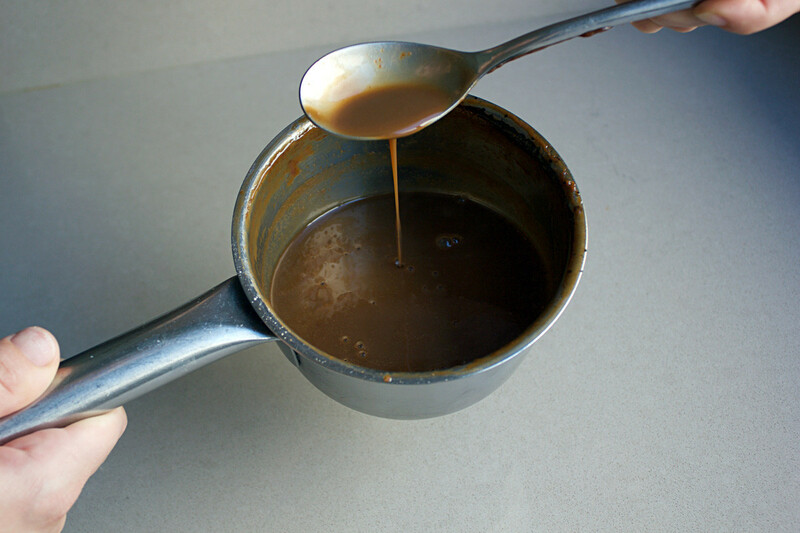 Add 100g of water to the caramelized mixture and cook until it becomes a homogenous syrup. Once it is ready, let cool completely. Bring the butter to room temperature and add 100g of syrup. 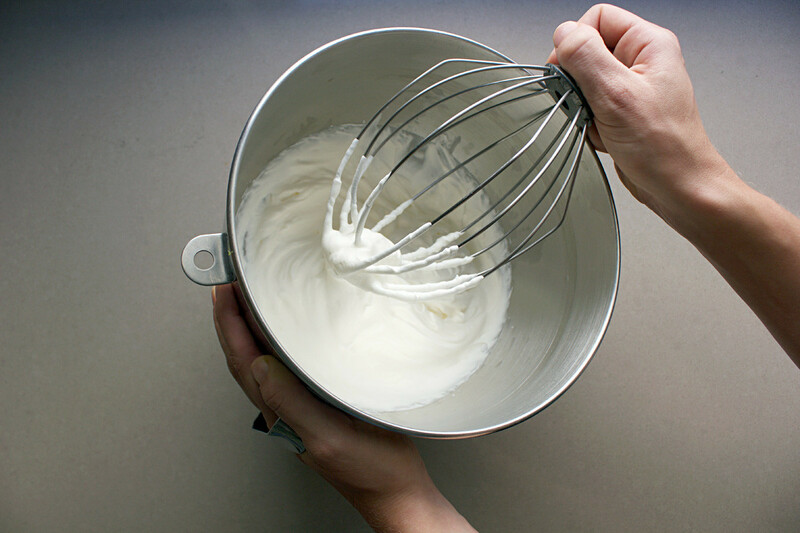 Whisk until it comes together; it should be a liquid and light in color. 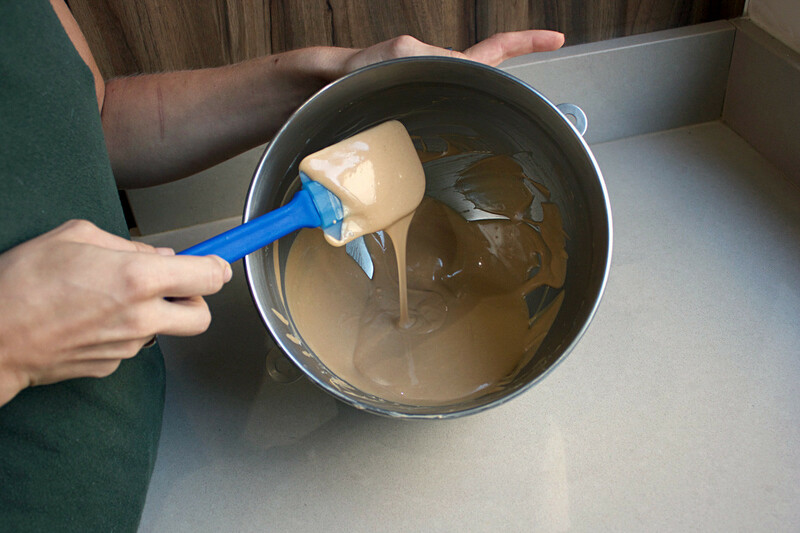 Place the icing into a flat container for easier glazing, and keep bowl with warm water near you in case the icing starts turning hard and cold. 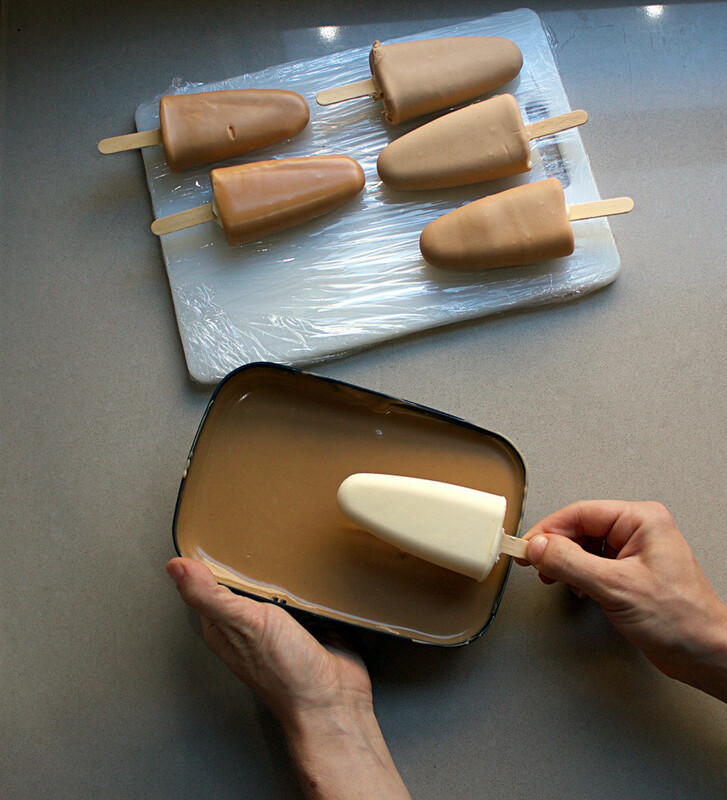 Glaze your plombir popsicles and place them in the freezer. Voilà, your own Borodino ice cream is ready! It’s not in the shape of a cylinder, but it tastes just like it used to, and you won’t get messy enjoying it!